My life has seriously been flipped upside down. When I found out I was pregnant with Mallory I did not anticipate any of what has happened. Who would? Seriously? Who would anticipate spending hours researching Apert and Pfeiffer Sydrome? Or having to learn how to operate a ventilator and a suction machine? Who would anticipate feeding their child through a hole in their stomach? Not this chick. That's for sure. Two and a half months in the NICU/PICU is enough to make anyone batty. It made me a friggin' lunatic. Juggling being there and being with my boys and my husband traveling again and every day life... it wasn't easy. I tried hard to make it a regular thing, a part of every day life traveling to the hospital, but it just wasn't. It was hell. Every time I left the hospital it was like I was leaving a piece of me there. I felt incomplete at home. I felt wrong. I felt guilty. Yep, that gets it's own sentence. As I type this, I can look down at her sleeping peacefully in her swing in the comfort of our home. I've been able to witness her smiling and experiencing her big brothers every day. She's with her family now. She's loved more than she even knows. And I feel so complete. The strangest thing about all of this is that I'm not scared. Our team at CHW really wanted us to have home care nursing. A lot of families around me even told me I should have it and that I'd appreciate it. But here's the thing... I'm a private person. I like my time. I don't like my toes being stepped on and most of all, I hate being watched. I felt like I went through all the training and learned how to care for my daughter for a reason. I listened carefully and took notes. I also just wanted to have the newborn baby experience. The late nights, the midnight feedings, the tired raccoon eyes.. all of it. It also helps that I have THE BEST partner a person could ask for. My husband, Frank, and I are the best team. Since the day we met we've been a team in some way. I know him and he knows me better than anyone else... good, bad, beautiful and ugly. What he forgets I remember and what I forget he remembers. There's no one I'd rather go through something like this with. And it melts my heart to see him with her. He lights up when he's around her. It's so special and sweet! Mallory is just another one of my children. Just like I had to figure out each of my other kids when they were born, I have to figure out her too. We are finally settling into a schedule. She's eating much better, and all through mouth now. I haven't had to feed her through her g-tube in 2 days. She's becoming interactive. Her personality is starting to develop. And for the first time since she was born, I finally feel like she recognizes me. That feeling wasn't there when she was at the hospital. I felt like she knew the nurses better than she knew me. It hurt my heart so much. She's a Broz. She's a fighter. She's tough. And she is going to get through everything life throws at her and we are going to help her do it. She has made me a stronger person. She's helped me to realize what's important. She has brought so much to our little family and I couldn't ask for anything better. 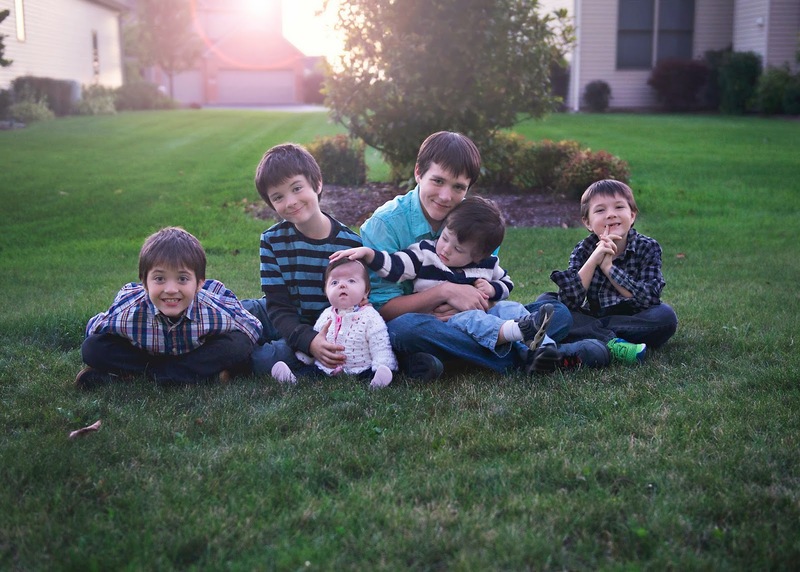 My children, Tyler, Jeremiah, Andrew, Nicholas, Quentin and Mallory... they are the best things I could ever ask for. They are all unique and special and we truly are a special family! My heart is full. My heart is full. I love my life right now and I wouldn't trade it for anything in the world!